Its origins rooted in the Middle East give this plant big size and strength, surprising for an automatic. 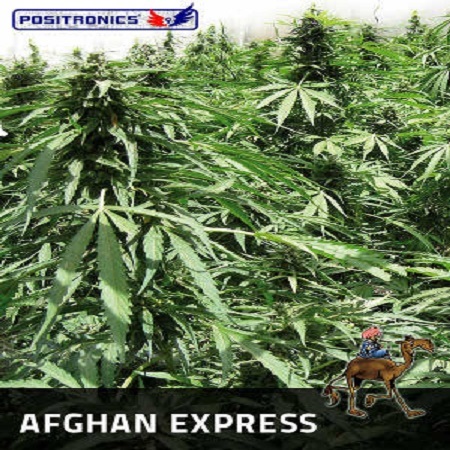 Afghan Express Auto Feminized Cannabis Seeds by Positronics Seeds: Its origins rooted in the Middle East give this plant big size and strength, surprising for an automatic. Afghan hashish flavor, if you want a fast crop ride this magic carpet for an experience of a thousand and one nights. Afghan Express a third generation auto-flowering variety, developed to amaze everyone for their refreshing virtues. The ancestor of our clone is an old Afghan donated by Wernard, chosen for its excellent ratio THC / CBD. The hybridized with our best ruderalis and offspring crossed each other for several generations and managed to stabilize and provide Afghan Express a great size and a high percentage of cannabinoids. Afghan plant structure: robust and large branches, leaves formed by thicker and wider leaflets of a bright green color. The buds are of a large size and completely covered with resin, will amaze any grower. You can make this plant freak auto flowering plants. If we start planting from May will give all its fullness in both the vegetative and flowering by non-experts doubt growers really is a plant autoflowering. AROMA: Strong smell like afghan hash nuances. Various mosses and roasted notes are perceived. TASTE: It floods the mouth feeling the best Afghan with more complex nuances reminiscent of honey and leather. EFFECT: As good Afghan effect of this plant is very pleasant and relaxing, enjoy that wonderful trip to the Middle East. INDOOR: is advisable to maintain a photoperiod of 18/6 or 20/4 until the end of flowering. It is recommended to sow directly in pots of not less than 10 litres, thus being able to handle the high growth of this new variety. You can clip a little size hours light cycle a couple of hours after the fifth week. OUTDOOR: It is recommended to plant in spring. The development is similar to that of conventional plants. On a sunny garden and planted in May will be able to compete in height of other indica. It can grow to a height of 1.80 to 2 meters which is a record in autoflowering, very appropriate to extract resin from the leaves (and flowers) by the amount of trichomes generating plant.